My Christmas holiday thus far had not involved nearly enough excess. Even sunbaking had been kept to a minimum, thanks to unseasonably cool New South Wales temperatures. When the sun did once again blaze, however, we immediately moved to the planned mode of excess...except of exercise, rather than consumption! After the morning's ride to the city and back we headed lakeside for a walk that became far longer than intended, since my father and I became so engrossed in our favourite topic - comparing the moods and tenses of Latin and German - that we neglected to turn around and head back towards our dinner destination until we were quite a way around the lake! No matter. 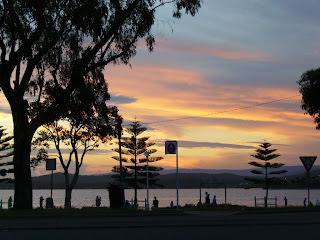 It was a stunning summer holiday evening, and our vantage point from a footpath table outside Lena's Lakeside Cafe was superb. Similarly, our BYO-ed Two Rivers Verdelho proved an excellent choice: dry with plenty of green aroma of apples, grass and pears. Lena's menu is ambitious, with a mainly Italian focus and several meat dishes. They also had five or six specials on, of which one curious combination caught my eye: chicken in a cream and prawn sauce with cashews and asparagus. Seemed to be a little bit too much going on there! There was a lot going on with the service as well: our waitress was excellent, offering extra information about our dishes (was I happy that mine came with sweet chilli sauce as well - definitely!) and asking attentive questions. 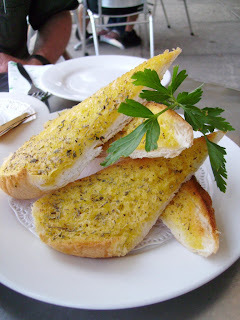 We started with some excellent herbed bread, positively melting with butter but still wonderfully crispy. 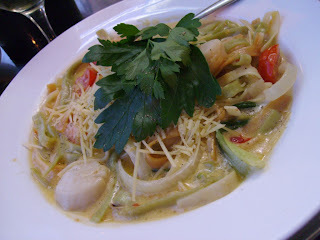 My main was the scallop and prawn linguine, with cherry tomatoes, zucchini and a white wine sauce. The seafood was admirably fresh and there was plenty of it. The tomatoes and zucchini added yet more to the evening's summery style. I was glad of the sweet chilli sauce to add some zing to an otherwise straightforward sauce. The serving was far more than I could comfortably tackle, and I was impressed that the waitress checked if I'd been satisfied with it before she cleared the plates. One minor point - is the pasta not fettucine, rather than linguine? 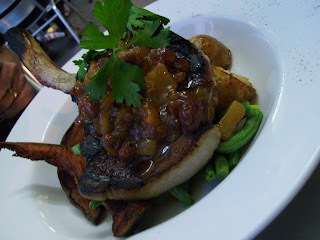 SG had the pork, with roasted sweet potato, pumpkin and beans. Our helpful waitress pointed out an unhelpful change to the menu: there was no more roasted sweet potato, only sweet potato mash. The shortfall was made up with extra pumpkin and spuds, but I'm always suspicious when a single ingredient is available in one form and not the other. The vegetables were, in any case, roasted to an enticing crisp, but the meat had been inexpertly handled so was too pink on the inside (especially for pork) and over-seared on the outside. It was an enjoyable dining experience, however, far better than the morning's efforts at Twist and sent us home ready for sleep at about 9pm, surely a sign of successful excess!